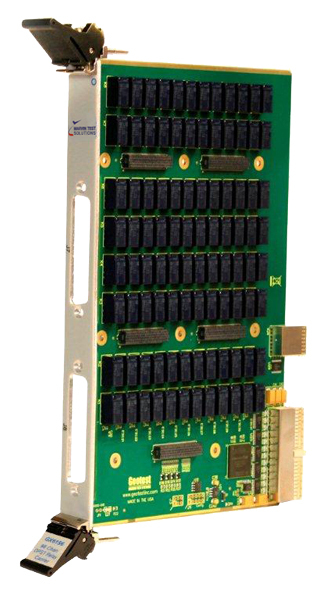 Switch and Control PXI Carrier Card | Marvin Test Solutions, Inc. The GX6196 is a 6U PXI switch and control board that can be used to create custom switching, signal conditioning, or specific UUT control interfaces. The board provides 96, 2 pole, form A relays, 8 digital I/O lines, and a serial digital interface. All of these resources are available via (5) inter-board connectors which interface to the user defined daughter / mezzanine board. The mezzanine board provides all connections to the unit under test (UUT) via two 78 pin D-sub connectors. The GX6196 is supplied with a front panel which accepts (2) 78 pin D-sub connectors. The GX6196 features 96 DPST relays which can be individually controlled via the PXI bus and interface via four interboard connectors to a mezzanine board assembly (user suppllied). In addition, there are eight digital LVTTL I/O control lines and a serial bus interface which are accessed via an additional board to board connector. Control for all of these digtial interfaces is also supported via the PXI bus, providing control for circuitry located on the user defined mezzanine board. The board is supplied with the GXSW library, a software package that includes a virtual instrument panel, and a Windows 32/64-bit DLL driver library and documentation. The virtual panel can be used to interactively program and control the instrument's relays and digital control interfaces from a window that displays the instrument’s current settings and status. In addition, interface files are provided to support access to programming tools and languages such as ATEasy, LabView, LabView/Real-Time, C/C++, Microsoft Visual Basic®, Delphi, and Pascal. An On-Line help file and PDF User's Guide provides documentation that includes instructions for installing, using and programming the board.